Here are five Bible verses that clearly defend the resurrection of Jesus Christ. The wages of sin is death (Rom 6:23) but since Jesus never sinned, death could not keep Him so since Jesus was sinless, the grave couldn’t hold Him as it says “God raised him up, having loosed the pangs of death, because it was not possible for him to be held by it” (Acts 2:24). Jesus apparently knew that death wouldn’t hold Him as He told the thief on the cross “I tell you the truth, today you will be with me in paradise” (Luke 23:43). By the way, the Romans were professional killers and they knew without a doubt when someone had finally died on the cross because that was part of their job but to make sure, the Roman soldiers “came to Jesus and saw that he was already dead, they did not break his legs. But one of the soldiers pierced his side with a spear, and at once there came out blood and water” (John 19:33-4) so Jesus was officially declared dead by the Roman soldiers. The greatest travesty of justice that has ever occurred in human history occurred when even the thief on the cross knew that Christ “has done nothing wrong” (Luke 23:41b) and even Pontius Pilate declared Him innocent (Luke 23:13-22) but where is the proof of Jesus resurrection? There are dozens of secular historians that wrote about Jesus’ crucifixion. For example, Flavius Josephus (AD 37 c. 100) was a professional Romano-Jewish historian and he wrote “About this time appeared Jesus, a wise man…And when Pilate, at the denunciation of those that are foremost among us, had condemned Him to the cross, those who had first loved Him did not abandon Him (for He appeared to them alive again on the third day, the holy prophets having foretold this and countless other marvels about Him.) The tribe of Christians named after Him did not cease to this day.” (Jewish Antiquities; 18.3.3 §63). The historical writings of ancient, secular historians testify of Jesus’ resurrection including Lucian of Samosata, Cornelius Tacitus, Maimonides and amazingly, even the Jewish Sanhedrin corroborated the eyewitness accounts of early Christians. If Jesus wasn’t really crucified and died on the cross, this would be the greatest historical cover up in human history. When Paul was speaking before King Agrippa, he said “that none of these things has escaped his notice, for this has not been done in a corner” (Acts 26:26), meaning that Jesus crucifixion and resurrection were a matter of public record and witness. 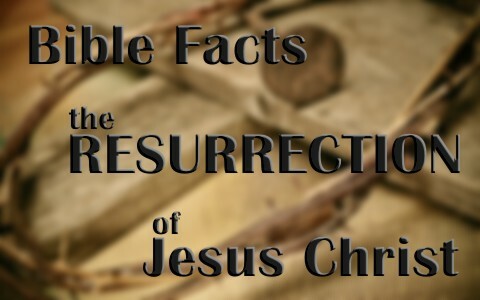 Paul spoke of Jesus’ resurrection as being fact and never questioned the authenticity of it as he wrote that “he appeared to more than five hundred brothers at one time, most of whom are still alive, though some have fallen asleep” (1 Cor 15:6) and besides this, “he appeared to James, then to all the apostles. Last of all, as to one untimely born, he appeared also to me” (1 Cor 15:7-8). How could five hundred eye witnesses all lie about this? How could over five hundred eye witnesses all hallucinate such a thing and all at the same time? The answer is they could not. Hundreds of eye witnesses are recorded in Scripture and we know that all Scripture is inspired by God (2 Pet 1:21; 2 Tim 3:16) and God wouldn’t get this most important of all facts wrong. The heavy stone that covered Jesus’ tomb wasn’t moved so that Jesus could get out; it was moved so that the eye witnesses could get in and see the empty tomb and the folded grave clothing. The tomb in which Jesus was buried was discovered empty by a group of women on the Sunday following the crucifixion and then when the tomb was found empty, the chief priests and elders bribed the Roman guards to say His body had been stolen and to have them say “His disciples came by night and stole him away while we were asleep” (Matt 28:13) which is ridiculous because the penalty for a Roman guard falling asleep on duty was death! Jacob Kremer is a New Testament critic and scholar who specialized in the study of the resurrection and he said “By far most exegetes hold firmly to the reliability of the biblical statements about the empty tomb” and he lists twenty-eight scholars to back up his fantastic claim. We are left with only three choices to reach a conclusion about the resurrection of Jesus Christ; either all of these biblical authors and eye witnesses lied about it, they hallucinated, or Jesus was actually raised from the dead. I cannot reconcile the belief that all the Bible authors who wrote about the resurrection all lied about it and then persuaded more than five hundred eye witnesses to lie about the resurrection as if they hadn’t seen it or knew it was true but neither can I believe that hundreds of eye witnesses all hallucinated at the same time and all saw the very same thing. We are left with only one conclusion; Jesus was raised from the dead and that means that we too can be raised to new life at Christ’s return or after we pass away. Paul wrote that it was a fact that “Christ has been raised from the dead, the firstfruits of those who have fallen asleep” (1 Cor 15:20) because “if the dead are not raised, not even Christ has been raised. And if Christ has not been raised, your faith is futile and you are still in your sins. Then those also who have fallen asleep in Christ have perished. If in Christ we have hope in this life only, we are of all people most to be pitied” (1 Cor 15:16-20). I cannot imagine Paul being beaten, whipped, chained, imprisoned, and suffering so much for something that never happened or was a lie. Previous post: What Does The Bible Say About The Duties Of A Pastor? Next post: How Did The Bible Get Its Name? What Does The Word Bible Mean?